You’ve heard it time and again – the best solutions are often the simplest. The same is true when it comes to managing stress with meditation. You may be surprised to discover that many of the most effective meditation techniques can be done without actually sitting down to meditate. In fact, the real beauty of meditation happens when you take meditation techniques off the mat, and into your everyday life. 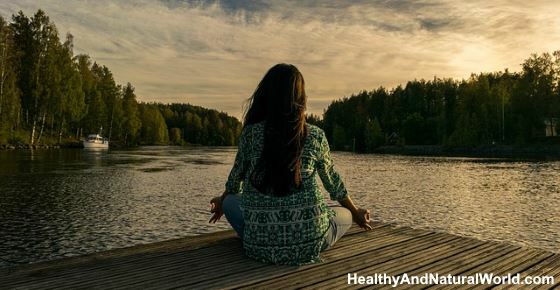 I’ve already written in the past about natural remedies for stress and anxiety, but you can also effectively reduce stress using meditation without actually sitting down to meditate. This post was written by my guest blogger Mary Meckley who is a meditation teacher, and it will teach you 7 ways to reduce stress by using simple meditation techniques – all without sitting in the lotus position! Your breath is connected to your mental and physical state. When you are stressed you are likely to take quick shallow breaths. Your body doesn’t receive the same amount of oxygen as it does when you are relaxed. This compromises your nervous system making you feel even more stressed. As soon as you start to slow down your breath, you allow your body and nervous system to calm down too. The next time stress threatens to derail you try breathing slowly and deeply to center yourself. When you are stressed, time seems to speed up. Your mind races, your heart rate increases, and your emotions start to surge. When you take a moment to slow down, and notice your present state, you are better able to put things into perspective. Big issues become more manageable instead of escalating out of control. The next time you are feeling stressed try focusing on your present state. When you are stressed there’s a tendency to hold tension in some part of your body. Often that is your jaw, your shoulders, and your stomach. Become aware of where you hold tension in your body. Do you notice any tension right now? If so, release it. Sometimes stress can be managed simply by listening to your own internal cues. When you tune into your body on a regular basis you nip stress in the bud before it has the chance to rage out of control. There’s a popular saying, “You get what you focus on”. It’s so true that your thoughts contribute to how you respond to a situation. The same event can happen to two different people. Each person perceives it differently according to what they think. A great way to replace negative thought patterns is by repeating uplifting affirmations. Affirmations are empowering statements that can be repeated either mentally, or aloud. They keep your mind focused on what’s important in your life. Keep your affirmations short so they are easy to remember. Try repeating, “Peace is all around me,” or “I am calm, happy, and focused,” the next time you feel yourself becoming stressed. Feed your mind with positive thoughts by creating a few simple affirmations to repeat throughout your day. Studies show that people who focus on gratitude experience less stress. When you feel stressed it’s easy to fall prey to victim mentality, and self-doubt. Focusing on gratitude can pull you away from negative emotions. You start to look for reasons to be thankful. It reminds you of what’s important in life. I know one person who even gives thanks for stress! She sees it as an opportunity to learn something new. A popular saying in meditation is “Your spine is your lifeline”. When you are stressed there is a tendency to scrunch your shoulders, and to tighten muscles in your jaw, and stomach. This exacerbates the feeling of tension in your body. When you gently straighten your spine you instantly relieve your body of tightness and tension. You feel stress drains off your shoulders. Try it right now. How are you sitting? Notice how you feel. Now sit up straight with your shoulders back. Notice the difference? To instantly reduce stress, relax your body by straightening your spine. You can shift your mood simply by the way you position your eyes. A lot of information is taken in through your eyes. This can lead to major sensory overload. A popular meditation technique is to give yourself a few moments throughout the day to lift your eyes upward. When you look upward you pull yourself away from the distractions of the people and events around you. You boost your mood. Try thinking of a negative thought as you look upward. It’s pretty difficult to do, isn’t it? Conversely, when you cast your eyes downward, you notice your mood drop as well. When you feel stress creeping into your day, shift your eyes gently upward. This is a guest post written by Mary Meckley, a meditation teacher who shows you how to make meditation easy. You can try out her free weekly guided meditations at www.SipandOm.com. This site is very informative and helpful. Thank you. no comment thank you .for your informative tips god bless . really very tanks…doing gr8 work…. very interesting article^_^!!! Keep up the good info.. Thank you, kindly for all the valuable information we can use daily to improve the quality of life we have. Looking forward to you next posts. I feel blessed to have found this site.